Winchester, in cooperation with Nosler Bullets, currently offers one of the finest big-game bullets available, the Fail Safe. However, the Fail Safe has one real problem and one perceived problem. With a steel insert surrounding the rear lead core and a steel cap locked on the base, it is expensive to make and buy. More importantly, many hunters think the Fail Safe expands little or not at all on game. Many hunters are used to seeing deer flop over dead in their tracks after being hit with a rapidly expanding bullet. 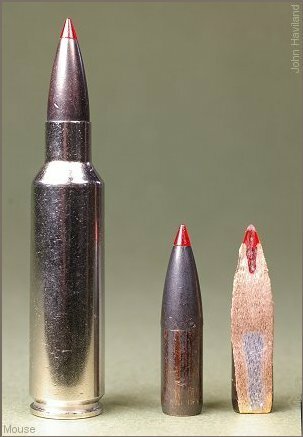 These bullets produce a crater of an entrance hole and sometimes an exit hole, complete with a wide circle of bloodshot meat, that is very reassuring to many hunters. Now shoot the same type of game with a 165-grain Fail Safe bullet from a .30-06 or even a .300 magnum. The deer may tip over on the spot. More likely, though, it will run ten or fifty yards and then fall over. That short run causes hunters concern that the bullet didn't perform well. The entrance the size of a quarter and exit wound the size of a half dollar make them wonder whether the bullet expanded at all. They ignore the fact the bullet must have expanded at least somewhat, because when the animal is field dressed the lungs have been turned into a red and fatal soup. Never mind, too, that any bone in the bullet's path was broken, yet the bullet continued straight in its journey, or that the bullet might have first plowed through two or three feet of game to reach the lungs.